A 17-year-old housewife has said she attempted to kill her rival’s two-week old baby because of the deep hatred she had for her husband and his first wife - the baby’s mother. The suspect, Hindatu Abdullahi, who hails from Wuro Bogga village, Duguri District of Alkaleri Local Government Area of Bauchi State, said she had been married to her husband, Abdullahi Ori, for two years. 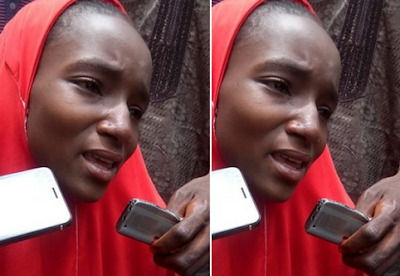 Speaking in an interview with newsmen while being paraded at the Bauchi State Police Command headquarters on Wednesday, she said her father forced her into the marriage when she was just 15 years old. She said: “My husband and I have been married for two years now and we have a child. He married me as his second wife. He used to love me dearly, but he suddenly started maltreating me. “He would beat me, insult me and abuse me at the slightest provocation. I reported his maltreatment to my parents all the time, but they have never believed what I told them, since it was their idea for me to marry him. Abdullahi, who sobbed while she spoke to newsmen said: “I have not been in good terms with my husband and my rival. We are always fighting. I don’t know why I did what I did, but I regret it. “Whatever punishment that will be given to me should be done, but every time I remember my action, I keep regretting doing what I did. According to the mother of one, her husband travelled to Saudi Arabia for the ongoing hajj; and when her rival went out, she went into her room and took her baby to her own room. After that, she added, she administered what was suspected to be poison on the infant, but the baby didn’t drink it. “I quickly removed his clothes and cleaned the poison with it. I became very confused, realising what I had done,” she said. Abdullahi said further that the baby was then rushed to the hospital and the nurse said the baby did not swallow the poison. “My siblings took me to my co-wife and I apologised to her and she said she has forgiven me; but she left everything to God to judge. “They called my husband on phone and told him and he vowed to divorce me when he returns from his pilgrimage,” she added. She claimed that she was given 80 strokes of the cane after her husband’s brother insisted that she must be punished for her crime. “He (my husband’s brother) took me to a vigilance office in our area and they gave me 80 strokes of the cane besides the tax they placed on my father, which he paid. “My husband’s brother said he wasn’t satisfied with the punishment I was given, so he took me to the Police Station at Maina Maji, where I spent two nights before they brought me here” (Bauchi State Police Command headquarters) she said.